Humility. It's the one characteristic that is essential to living the Christ-honoring life. Opportunities to reveal our Christ-like character are presented daily. How we respond to situations reveals much about us. Sometimes we evaluate ourselves and assume we're further along the spiritual journey toward maturity. We may feel like a mature follower of Christ but our actions can speak louder than words. King Josiah was the great grandson of King Hezekiah. It was reported that Josiah's father, Amon, was the most sinful of all the wicked kings of Judah. He was assassinated in his palace by a band of conspirators composed of his own servants two years after inheriting the throne. The people avenged his death by slaying the conspirators and putting the king's son, Josiah, on the throne at age eight. Amon declared publicly he could live the wicked godless life and repent like his father Manasseh on his deathbed. Amon never had the chance to repent. You can read more about the depravity and succession of this family of kings here. Repentance plays a crucial role in the God-honoring life not only for individuals but for nations as well. God responds to our humbled heart. The birth of Jesus was preceded by the birth of John the Baptist whose message of repentance prepared the way for coming King of Kings to enter our world. Humility comes before repentance like pride before a fall. 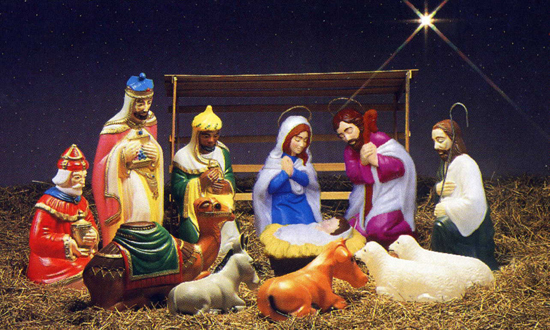 The familiar figurines of the Nativity are often formed kneeling at the side of the baby in the manger. Like them, may we humble ourselves, repent and kneel at the side of his manger as we find our way to the Christ child this year.